The Indonesian central bank, Bank Indonesia (BI), announces the outcome of its monetary policy meeting on Tuesday (23 October). We believe it’s time for BI to pause the tightening started in May this year, and subsequently intensified amidst the emerging market currency contagion that saw the Indonesia rupiah (IDR) plunge in value. As part of its currency stabilisation drive, BI lifted the policy rate by a total 150 basis points to 5.75% through to September. With well-behaved inflation, dipping below 3% year-on-year in September for the first time in over two years, monetary policy remains geared towards stabilising the Indonesian rupiah. And the USD/IDR appears to have traded tightly around 15,200 this month after an early October spike. Recent economic reports-, such as the trade balance swinging back to surplus in September and a lower-than-expected government budget deficit this year, are contributing to improve investor sentiment towards the currency. We believe this has taken pressure off the central bank to hike rates at the forthcoming policy meeting. 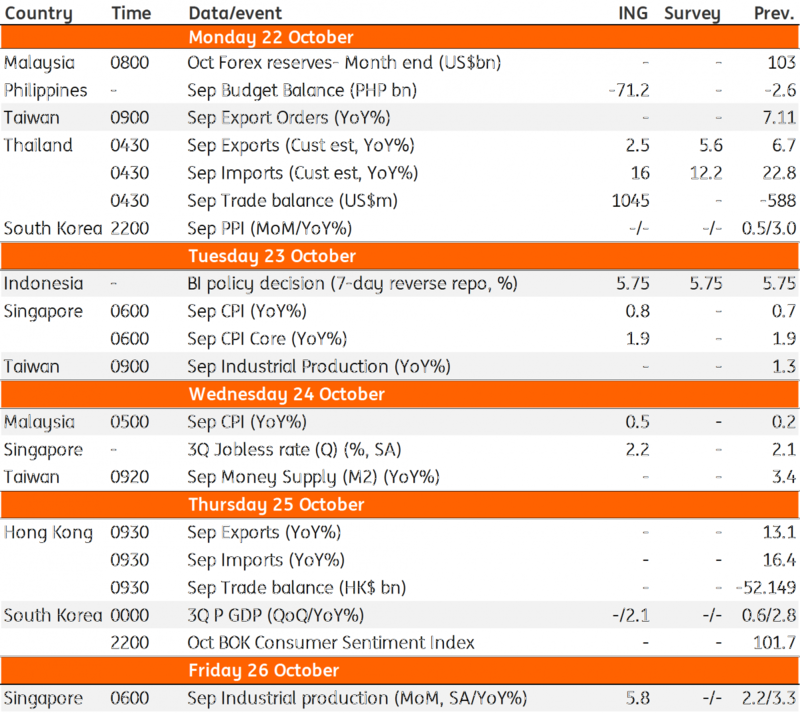 September manufacturing data releases from Taiwan and Singapore will help to fine-tune estimates of GDP growth for these economies, while Korea will report actual GDP data for the third quarter. Underlying our estimate of 2.1% year-on-year growth in Korea’s GDP in 3Q, which is close to the low end of analysts’ estimates ranging from 2% to 2.7% in the latest Bloomberg poll, is a sustained slowdown in export growth. September’s 8.2% YoY fall in exports was the worst showing in over two years although partly coming off a high base, as growth peaked at 35% in the same month a year ago. As it left monetary policy on hold this week, the Bank of Korea also downgraded its outlook for growth this year and next, the second downgrade this year. We don’t think it’s just Korea. 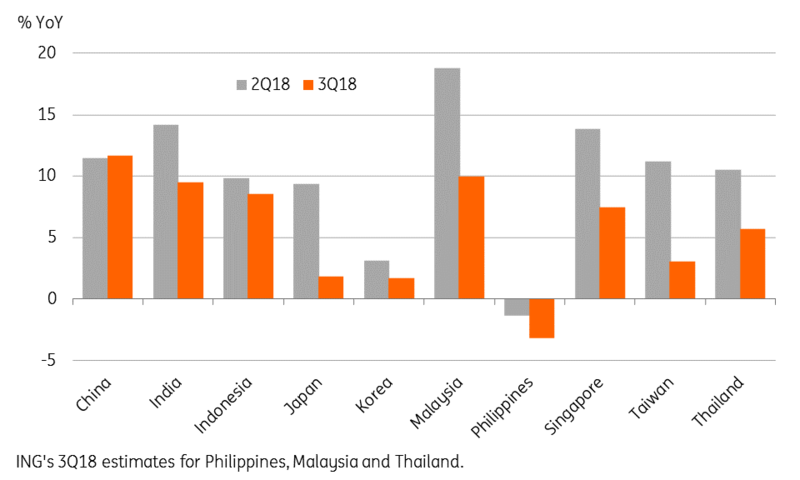 Asia’s other export-reliant economies Taiwan and Singapore are also exposed to a growth slowdown amid lingering US-China trade tensions. Singapore’s weaker-than-expected non-oil domestic exports in September are likely to have depressed manufacturing, raising the risk of a downward revision to the 3Q advance GDP growth estimate of 2.6%, which in itself was a sharp slowdown from 4.1% growth in 2Q. And being on the frontline of the US-China trade conflict, Taiwan’s exports have already started to take a beating, keeping both manufacturing and GDP growth in the low single-digits. Look out for Taiwan’s export orders data for September; orders' growth has been firm but it failed to translate into actual shipments. 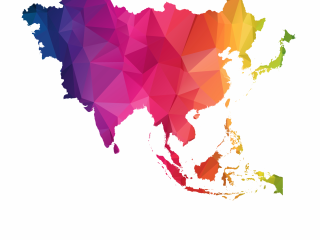 Of the two countries to report September inflation data in the coming week, Malaysia and Singapore, we consider Malaysia’s to be the more closely-watched report. This is not because of any alarming outcome but because of the re-introduction of the Sales and Services Tax (SST) from 1 September. Replacing the Goods and Services Tax (GST), which was scrapped in June this year, we anticipate the SST impact on consumer prices to be benign, keeping inflation well under 1%. With persistently low inflation through most of 2019, the central bank (BNM) will be under no pressure to change policy next year. Similar to Malaysia, Singapore continues to enjoy the lowest inflation among the Asian economies. We expect headline inflation to tick up to 0.8% YoY in September from 0.7% in the previous month but no change in the core inflation rate from 1.9%. The central bank’s (MAS) semi-annual Macroeconomic Policy review will provide insight into its thinking behind the recent tightening via a slight increase in the slope of the SGD-NEER policy band. Apart from India and the Philippines, inflation in most other Asian countries has been subdued. This is despite higher global oil prices and weaker Asian currencies this year.